Congress leader Ghulam Nabi Azad and National Conference stalwart Farooq Abdullah made the announcement. JAMMU: After tough negotiations, National Conference (NC) and Congress on Wednesday sealed seat-sharing arrangement for the six parliamentary seats in Jammu and Kashmir. While the Congress will contest the two Jammu seats, the NC will field its candidate in the Srinagar constituency. The remaining three seats will see a “friendly contest” between the two parties. “We are united. 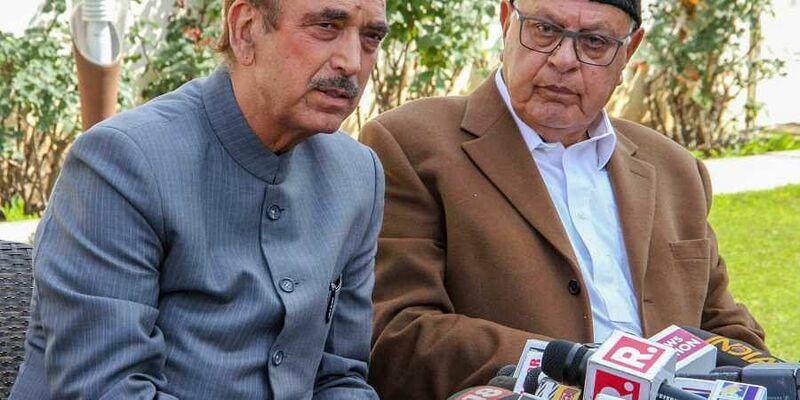 The Congress will contest two Lok Sabha seats in Jammu, while Farooq Abdullah will be the joint NC-Congress candidate from the Srinagar seat,” senior Congress leader Ghulam Nabi Azad said in Jammu. He announced the seat-sharing arrangement in a joint press conference with Farooq Abdullah and other NC and Congress leaders. Abdullah said there would be a “friendly contest” between the two parties on Baramulla and Anantnag seats in the Valley and Ladakh. “A friendly contest means that two parties will not go hard against each other and will make a joint effort to defeat the opponents. It matters little which of us wins, as the victory itself will boost our fight against communalism. We are not fighting against each other but against a third party (BJP),” Azad said. Azad announced that party leaders would campaign for Abdullah in Srinagar. “I, Ambika Soni and other Congress leaders will campaign for him,” he said. Asked whether the arrangement would work, Azad said, “It will definitely work. We have good presence in both the regions (Kashmir and Ladakh) where there will be friendly fight. We trust the voters to make the right choice.” Abdullah, too, voiced hope that the arrangement will fetch electoral dividend. “What do you mean by dynastic politics? If son of an actor becomes an actor, is it a dynastic thing? Similarly, if a director makes his son a director, is it a dynastic thing?” the NC president said. “I am Sheikh Abdullah’s son. I grew up learning politics,” he said.